Do you walk into a store, see a lipstick and have to buy it? Well, we are with you. Anything beauty sits well with us, and we are for lack of a better word, addicts. Although, we like to call ourselves makeup enthusiasts, sometimes we just buy a little too much. There so many products out there and most of them are trial and error when it comes to finding shades and textures that work well for our skin tones. Beauty is a battlefield, but we’ve finally found a cosmetics line that we’ll be sticking with for years to come. Doucce Cosmetics is a line made for uptown fashionistas and right up our alley. It gives you the look of luxury with a natural finish, so you won’t look like you over did it. Doucce has everything from foundation to lip gloss, and when using these products, you might feel like you’re painting your face the perfect shade of prestige. Doucce was inspired by the French word “douce” which means new and elegant. Born from a small startup in NYC, Doucce is now becoming the preferred brand for makeup artists and has an “in” with fashion’s elite. Our experts at MyTopFace tried the glosses, the mascaras, and the foundations and we think it’s safe to say we’ll be switching our beauty routine up a lot. Our favorite product was without a doubt, the All Day Mineral Foundation. The foundation trend today is long wear, and we’ve tried the “best of the best” like Estée Lauder’s Double Wear, and it does not hold a candle to the Doucce face base. Unlike the famed Estée Lauder Double Wear, Doucce All Day Mineral Foundation isn’t heavy and still gives the full coverage that the Double Wear gives, with no excess product when you want to build, for a little more coverage on blemishes and dark spots. Apply with a foundation brush or for an even more flawless finish, use the ever-famous beauty blender, our go-to application tool. The Doucce foundation comes in a chic pump glassware bottle, so you can dispense the proper amount and leave your counter mess-free. Remember to shake this foundation first. Another plus for the Doucce formula: it’s actually $5 less than the Double Wear and won’t look cakey or crumble. Because the Double Wear finish is so matte, you can’t exactly use setting or finishing powder after you apply your base because the liquid will begin to flake. That’s not the case with the Doucce Formula. The All Day Mineral Foundation appears to have a more even setting with the addition of Doucce’s Powder Cake. The luscious Powder Cake or pressed powder from Doucce is a silky-smooth formula that helps set your foundation and keep the oilier areas of your skin matte without over drying. It goes on very sheen, won’t cause your foundation to cake and can even be used alone, for a light dusting atop a shiny complexion. Liquid foundation tends to oxidize once it sets on your skin and can dry a shade darker, causing a slight difference in color between your face and neck skin. 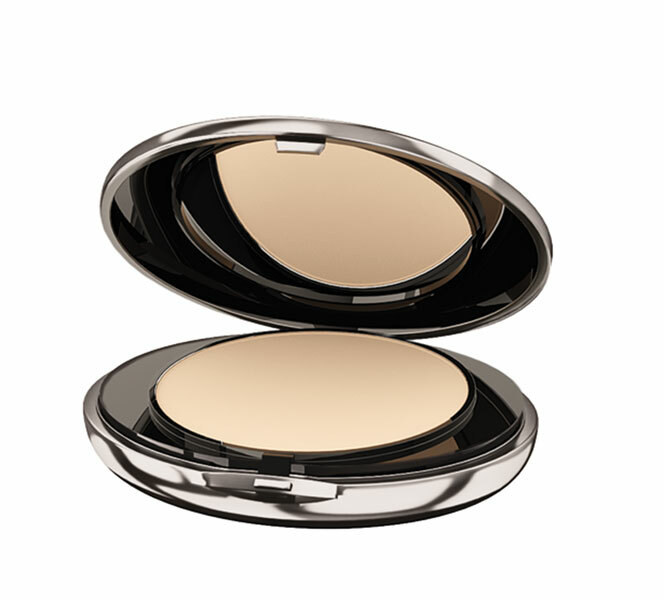 Using the Powder Cake lightens the newly darker shade ever so slightly and creates a flawless finish. The combination of these two products will leave your skin looking smooth, young and natural. 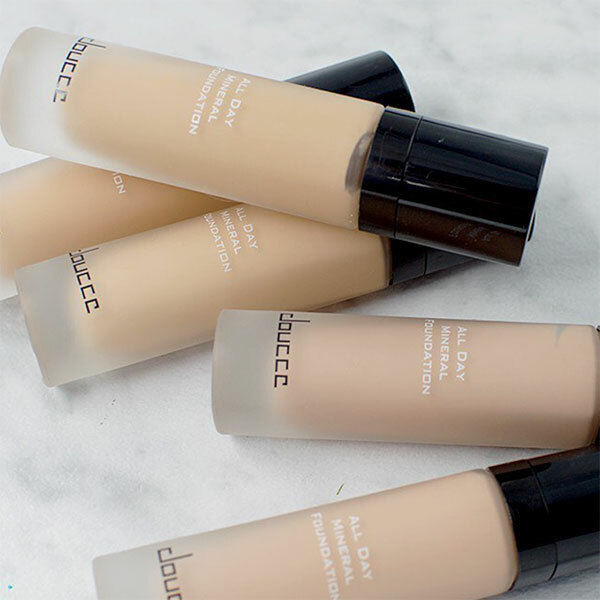 You never have to worry about looking like you have too much makeup with Doucce foundations. If you’re more of just a powder person, there’s a base for you too. 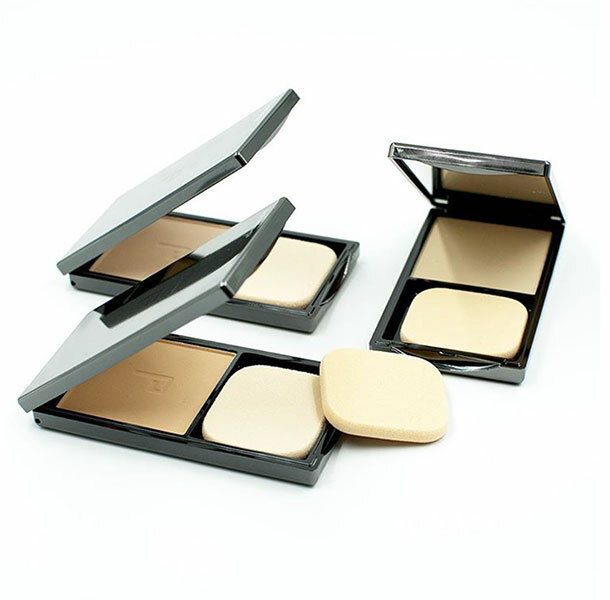 Try the Mineral Two Way Cake, a silky pressed powder you can pat on gently as a full coverage foundation or simply use atop your liquid base on your T-zone, to blot out stubborn shine. The powder won’t give the coverage of a liquid foundation, but you already knew that. However, it gives just the right amount of coverage for those beauty mavens who want to perfect their natural complexion with ease. The Doucce Mineral Two Way Cake also works well as a contour. Just use an angle contour brush for application, instead of the pressed pad. 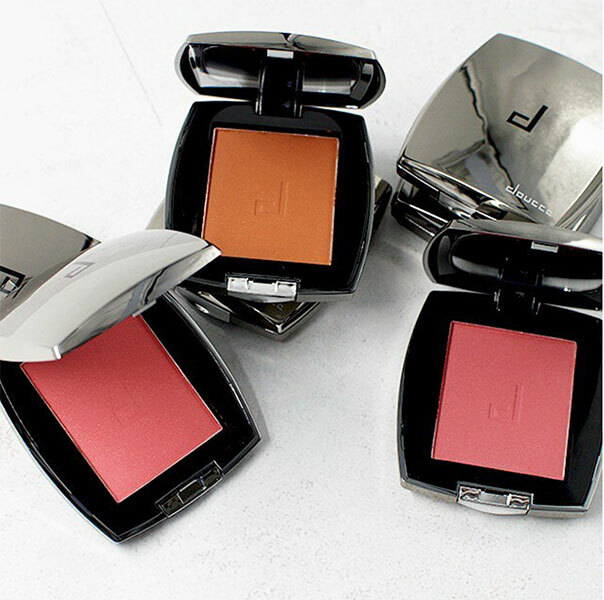 And, after you’ve made up your skin, with a flawless base and chiseled contour, you’ll need just the right color blush to finish off your skin’s radiant look. The Doucce Cheek Blush comes in 10 different shades, from baby pinks to 90s inspired mauves and nudes. All matte shades are highly pigmented and are the perfect color for any skin tone, even porcelain shades. All you need is a light dusting with these cheeky tones especially because you’ll want to finish off your style with the perfect lip. 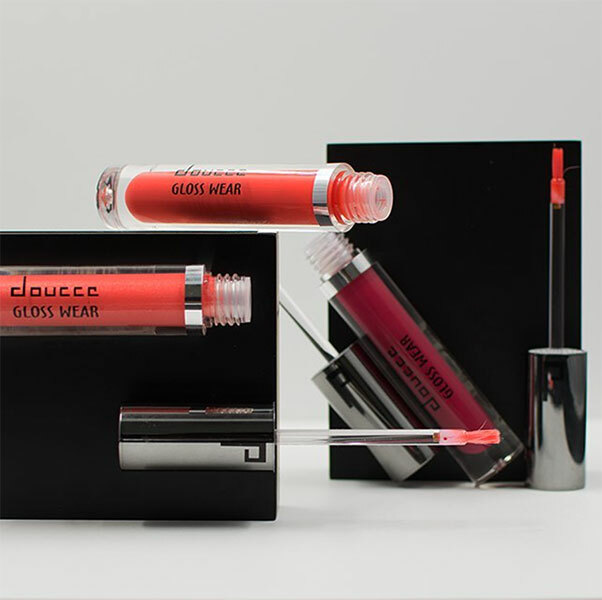 The Doucce Gloss Wear Lip Gloss is also highly pigmented and goes on with a smoothing brush, which makes for better application. Because these shades are so vibrant, we recommend using a lip liner for a neater finish. The Gloss Wear Lip Gloss formula leaves a smooth, kissable finish on the lips and the color is both buildable and easy to subdue with some old-school blotting. Blotting these fiery shades will leave you with a stain-like essence and transform your look. After blotting to a stain, your lips feel fuller and softer, as if they have been exfoliated. Our experts tried the Deep Red, Crimson Lust and Sweet Wine Shades, with our favorite being the Crimson Lust. This shade is a lighter, fun shade, while Sweet Wine is more trendy and dark, and the Deep Red is more traditional. 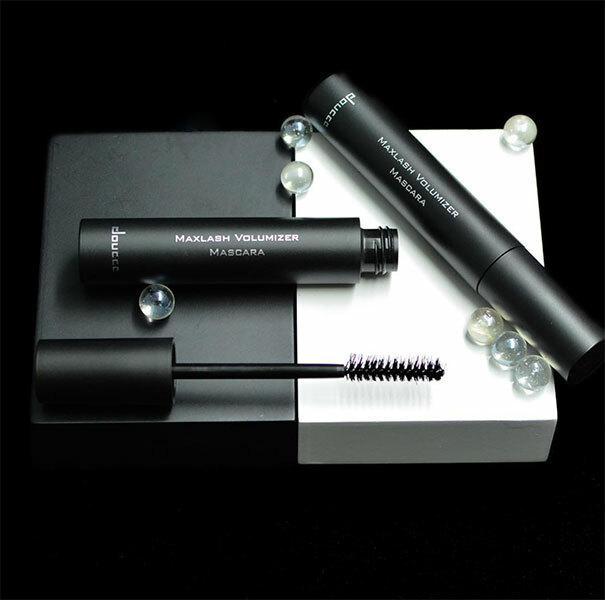 While we indulge in all that is the Doucce magic, we cannot forget the truly transforming, Maxlash Volumizer Mascara. This lash enhancer has a carbon black pigment, and its brush is made for high-volume lash drama. Dress it down or dress it up by using one coat for everyday wear or pack on the drama with multiple sweeps to pump up your sultry smoky eye for a night out. Made with fibers and just the right dimensions, this mascara will save you tons of money on false lash salon treatments. When we have a makeup of this stature adorning our complexion, we can’t help but wonder what we’re missing? What could complete our new look and add to the luxurious feel? Jewelry of course. When we wear the best cosmetics, we want to choose the best accessories to match our style; that’s why we always turn to Zacasha to help us stand out from the crowd. One of the biggest trends of the last few years has been the tassel. That’s why when we go to choose a piece of jewelry from our collection at home, our go-to item is the Hematite & Silver Rosario Set in Black from Zacasha. This necklace not only hits on the tassel trend but the layering trend as well. 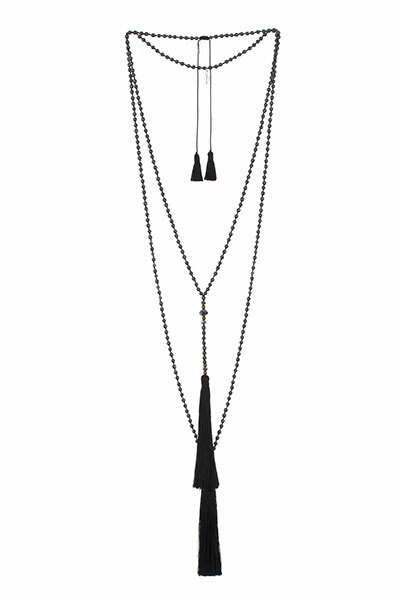 It has two large tassel dangles in front and two small tassels on its length adjuster. Zacasha jewelry is hand-crafted in Bali and known to have protective and healing properties. Hematite was used in ancient Egypt to reduce inflammation, tumors and blood diseases. Hematite helps you stay connected to the Earth, balancing your mind and body connection, ridding you of negativity and boosting self-confidence. This necklace can be worn casually or with a dressier outfit for cool-girl bohemian chic vibes. Whether painting our face to perfection or accessorizing to add a little glamour, both our makeup and jewelry need to reflect a sense of cool and classic beauty. Doucce will not only keep you looking like your living in the lap of luxury, but it will also keep your skin looking clear, natural and approachable. With the edgy Doucce product packaging, you can take these gunmetal, chic items anywhere, and have friends asking where you got your new wave palettes. All Doucce cosmetics glide on with ease and still leave you feeling naturally radiant, not weighed down by your makeup. Accessorize your Doucce canvas with trendy Indonesian styles from Zacasha jewelry, and you’ll have everyone’s eyes on you.